Families come in all shapes and sizes. There are no strict age limits but beFriend is mainly for older people and families with young children. We prioritise those registered with the Steyning Health Centre but will consider all referrals on their own merit, and so long as we have a suitable volunteer available and the home situation is considered safe, we will do our best to help. beFriend trains volunteers who can work with either a family or individual by offering friendship, drawing alongside you and listening, helping you to find solutions to your daily challenges and bringing hope into your life again. Your beFriender will visit you weekly in your home and help you get involved with other activities and events appropriate to your circumstances. Sometimes we find ourselves feeling lonely and lost and it seems like there is no way out. We want you to know you are not alone. 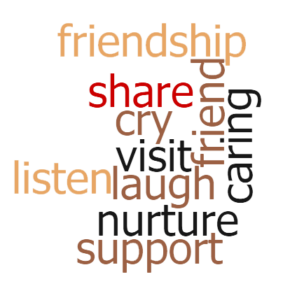 beFriend will find a volunteer to journey with you, encourage you, offer friendship, practical help and support. beFriend exists to support those facing loneliness and isolation due to a change in their circumstance. beFriend offers friendship and encouragement in the home environment enabling people to take small steps which build resilience, and move towards making a positive change. beFriend has grown out of the community work based at The Hub in Upper Beeding. In response to the local community wanting a space to meet with friends and make new ones, the Hub Café was opened in January 2014. We soon saw that loneliness and isolation was an issue for older people and The Hub launched the Steyning, Beeding and Bramber and District Link Visiting Scheme; a befriending service for isolated seniors. However, we’ve learned that it is not only older folk who find themselves without family and friends to help and support them through the ups and downs of life. Many parents live away from wider family and are in need of additional help and support with the challenging task of raising children. As a result, beFriend was born; a team of trained volunteers ready to journey with families or individuals for whom life has become lonely and challenging, who would benefit from a positive friendship that helps them to help themselves. beFriend is based on Christian values and seeks to demonstrate God’s unconditional love for everyone regardless of background, beliefs or circumstance enabling people to live life to the full. beFriend is for people of all faiths and none. Listen and encourage them to take small steps towards making a long term change in their quality of life.